I have always been mesmerized by tie dyeing, often using it to rescue old white shirts that I had inevitably stained in some way or another. When I came across Kalen’s booth at West Coast Craft I was initially seduced by a pair of luxurious blue & brown velvet overalls that she had meticulously hand-dyed. Despite walking away from the booth several times in a fit of indecision I was ultimately drawn back to the magical overalls and was fortunate enough to connect with Kalen about her brand and hand-dyeing techniques. 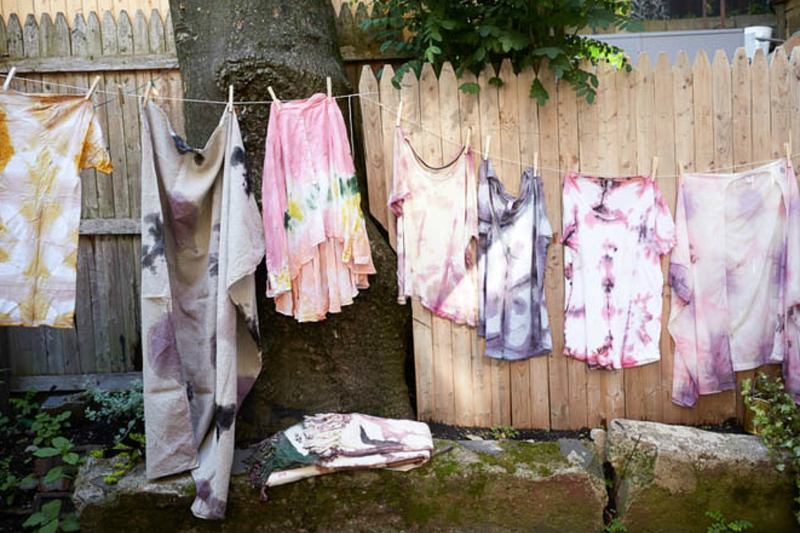 Kalen has turned her obsession with hand-dyeing into her own clothing line, Upstate, and even uses it in her freelance gigs as a set designer. 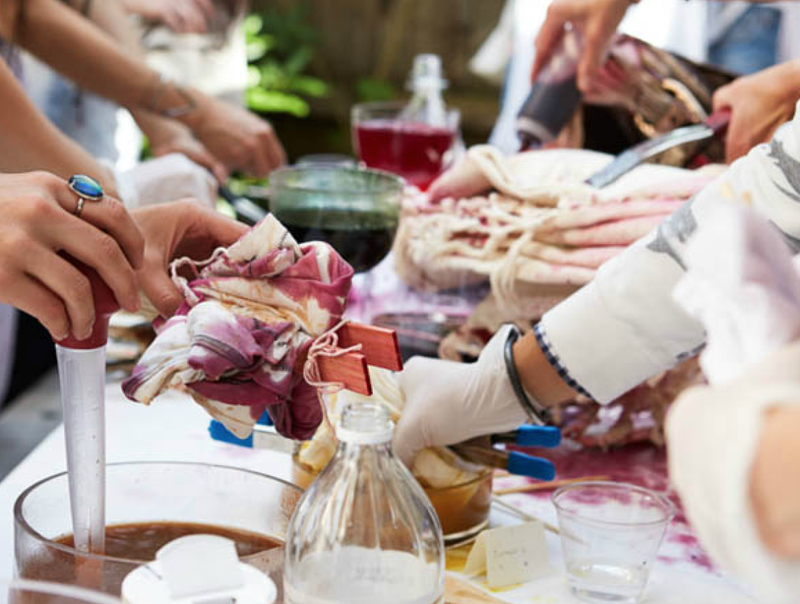 As it happens for many people, her obsession started with the Japanese dyeing technique, Shibori. The intricate and seemingly endless dyeing patterns transfixed her and she began to explore the range of natural and fibre reactive dyes. By the time she started Upstate Kalen was already living in New York and working as a set designer so hand-dyeing was more of a hobby on the side. “It all started with these gigantic silk wraps.” She started trying to make them and then just couldn’t stop doing it and it grew into an entire womenswear collection and what is now Upstate. Kalen now essentially has two full times careers, balancing Upstate with her freelance set design projects. Sometimes the two intermix when she is requested to hand-dye curtains, wallpaper or other textiles for her set design projects. Kalen also hosts natural dyeing workshops and agreed to give us one of her recipes. She uses everything from hibiscus flower dye, turmeric, indigo and cochineal, an insect that lives on cacti. Below is her beautiful beet red dye; try it out on one of your old white pieces of clothing that needs to be upcycled. Upstate is about to release their velvet fall collection, so keep an eye on their website. 1.Treat your fabric before hand in a bucket of water with alum or soda ash (1 tablespoon). Soak for 30 minutes and hang dry. 2.Cut up 8-10 beets. 3.Put in an enamel pot and cover with water. 4.Bring to a boil for 10 min then turn down to a simmer. 5.Add your fabric. **You can fold it up and tie with with rubber bands, string, or clamps to give interesting resists throughout the fabric. 6. Simmer for 1-2 hours on low. 7. Turn off heat and soak over night. 8. Rinse in cold water with a light soap and hang dry! All dyeing photos were taken by Alpha Smoot.